Good news is never late. It arrives precisely when means to. If you’ve been following our friends from Weta then you know the last little bit has had some very cool news for collectors. 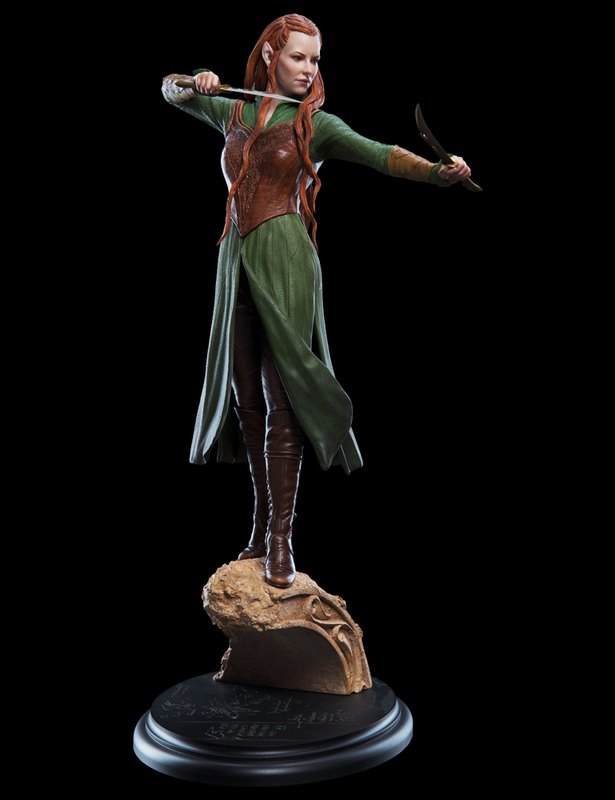 One of the most popular statues from The Hobbit line came from the character of Tauriel. She sold out pretty quickly and on the secondary market can come at a pretty high price. Fans have been asking for a new statue of the character, and that wish has finally been granted. You can grab the new Tauriel for $349, which is a fair amount under the price on ebay. She comes with an edition size of only 800 pieces so she’s likely to not be around too long, and you can expect her to land in your collection in March of next year. Easily one of the show stealing pieces last year at SDCC, Thranduil on Elk just drew you in when you visited the Weta Workshop booth. This had fans online chattering at just how amazing it looked through the pictures posted by TORn and other collectors at SDCC. Needless to say, all of us were looking forward to his arrival. There were some snags on the production version, making this a somewhat controversial piece within the fanbase. It’s still a super impressive and overall good looking piece and one that will look good in your collection. 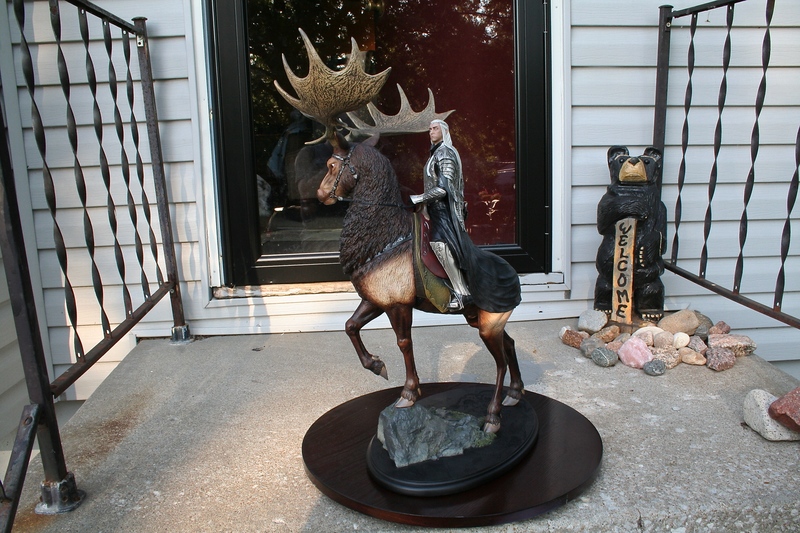 As always here are my thoughts on Thranduil on Elk. 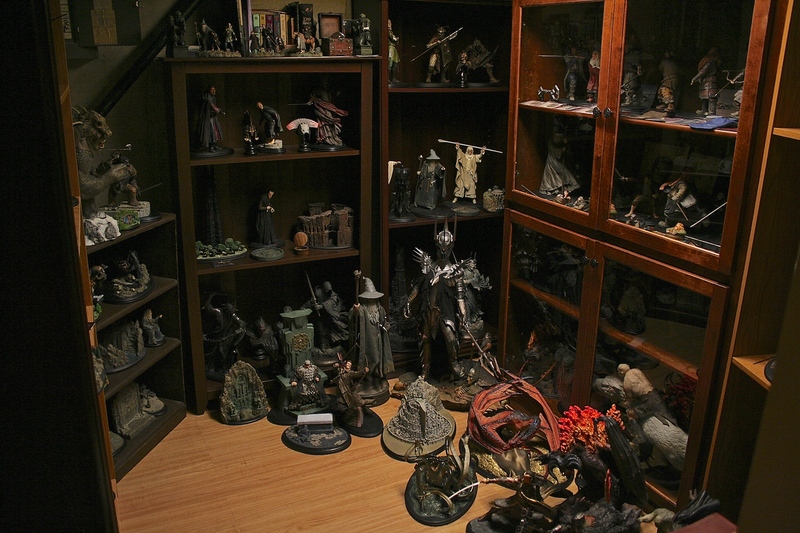 First, we want to thank all of you who have joined TheOneRing.net Collectors Club and shared some of your very cool Middle-earth related collectibles. This has been so much fun having you all involved with Collecting The Precious. As you all are aware we ran a contest with our friends at Gemr until the end of June. The winners have been picked, confirmed, and items have been mailed. We want to congratulate the following members of the club: Congratulations @gabe.meek98 ! Who won a larger than life bus stop poster for The Hobbit: Battle of Five Armies! We hope you have a wall big enough for this bad boy. Congratulations @madeyegamgee ! 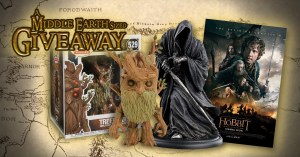 Who won Weta Mini Ringwraith Statue! It’s pocket-sized evil! Congratulations @feerthedragon ! 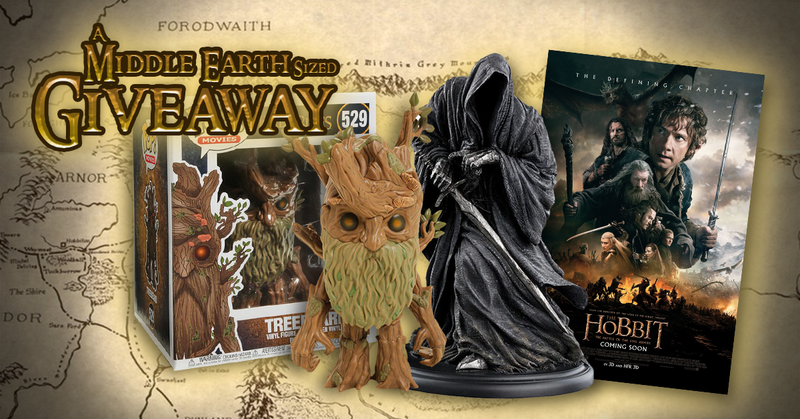 Who won an XL Treebeard Funko Pop! It’s bigger than other Pops but a LOT smaller than the real Treebeard — so it will actually fit on a shelf! As you will recall, late in May we announced the TORn Collectors Club, and we announced it with a contest for new and current members. We wanted to remind you, if you haven’t joined yet and you want to win a pretty cool prize, that the contest ends tomorrow at midnight PST. So do not hesitate to come and join if you want to chat with some amazing folks about something so precious to us as fans of Middle-earth. You’ll discover over 3000 people you can chat with, share your collectibles with, review items, buy/sell/trade, etc. There is no shortage of fun going on in the club and we can’t wait for you to join us. So come on and show us how you Collect The Precious. 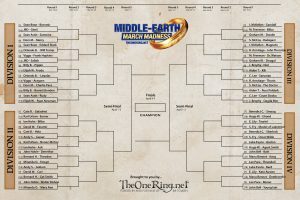 We are now about halfway through the first Round of our Middle-earth March Madness, and some of the match ups are really close, while others have one contestant running away with the race. 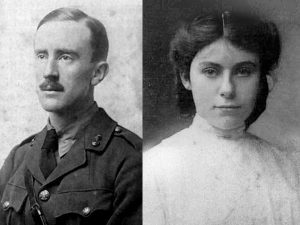 Because this year’s bracket has the newly added twist of featuring characters portrayed by the actors who brought our most beloved Middle-earth characters to life, this rundown will include a little about those non-Middle-earth characters. The traditional match ups first: Boromir is facing off with Gimli in a close race, make sure you vote before the evening of March 22, this one is close enough that your vote will definitely matter. The contest between Samwise and Merry has the acclaimed gardener running away with nearly all the points on this one. Surprisingly, the other match up of Hobbits is unexpectedly close, with Frodo holding a slim lead over Pippin. To cap off the Fellowship match ups, Aragorn is soundly beating Legolas. With the non-ME characters, there is just as much variety in vote percentages. Sean Bean’s portrayal of Eddard Stark in Game of Thrones has a narrow lead over Orlando Bloom’s Will Turner, from Pirates of the Caribbean. The next race is just as close, between Viggo’s portrayal of real life long distance, endurance horse racer Frank Hopkins with a slim lead over John Rhys Davies’ Sallah from Raiders of the Lost Ark. There is a neck and neck contest going on between Dom’s Charlie Pace, the recovering addict rock star from Lost has a very narrow lead over Billy Boyd’s Barrett Bonden, the coxswain on the HMS Surprise in Master and Commander: The Far Side of the World. Not close is the fact that Sean Astin’s earnest performance of Rudy is decidedly running away with the race, leaving Elijah Wood’s Ryan Newman from Wilfred. “You All Everybody” should get out and vote before 10pm et on March 22. 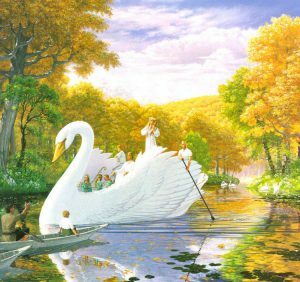 In this division, the ME match ups are as follows: Galadriel has firm control of the contest with Eomer, the Lady of Light is not easily taken out of events. Faramir has a small lead over Old Bilbo, so you may still be able to give a helping hand to the Hobbit that found the One Ring in the first place. Eowyn and Gollum are nearly neck and neck, can the Shieldmaiden of Rohan defeat the sneakiness of Smeagol? Her uncle Theoden, however, is wiping the floor with Denethor, who became tainted by his contact with the Palantir. The non-ME roles are proving interesting as well: Cate Blanchett’s Hela, the Goddess of Death from Thor: Ragnarok has a decent lead over Andy Serkis’ Caesar, the ape leader from Planet of the Apes. At the same time, Karl Urban’s Dr. ‘Bones’ McCoy is soundly beating Sir Ian Holm’s Ash, the rather inhuman android from the original Alien movie, who admired the xenomorph just a little more than he valued human life. There are two battles that are very close and would benefit from a last fit of voting on your part. Those are between David Wenham’s Carl from Van Helsing just edging out Bernard Hill’s Captain Smith from Titanic, who did his duty and went down with the ship. The other close battle is between Miranda Otto’s Mary Ann from War of the World with a slim margin over John Noble’s brilliant, but crazy Walter Bishop from Fringe. On the other side of the bracket, let’s see who is doing well for the traditional match ups: Believe it or not, Gandalf is stomping all over Young Bilbo, guess that is punishment for not telling the truth about finding the One Ring. Dwalin has a sizable lead over Radagast, but then, he does have a massive War Hammer, this is not surprising. Amongst the Dwarves from The Hobbit, Kili is slaying pick pocket Nori, while Thorin is not really faring well against Saruman. Feel free to give a boost to those you wish to support and share with your friends, it’s all in good fun. The non-ME side of things has: Sir Ian McKellen’s Magneto soundly thrashing Richard Armitage’s John Thornton from North and South, the clever mutant is probably dismantling all of Thorton’s looms as this is written. Graham MacTavish’s Dougal from Outlander is all but finished at the hands of Martin Freeman’s Dr. Watson, it’s those modern Doctors he can’t handle, clearly. As expected, Christopher Lee’s Count Dooku from Star Wars: Revenge of the Sith is trouncing Jed Brophy’s Dagda More from the Shannara, this writer would love to see this battle realized on screen. A little less expected, but even cooler for that is that Sylvestor McCoy’s Doctor has the upper hand on Aiden Turner’s Ross Poldark, Time Lords really do know how to come out on top when needed. Last division match ups, for the traditional segment: Elrond has a decent lead over Smaug, which is fascinating to see. The Master of Laketown is no match for Tauriel, she saw his selfishness and is leaving him to his own ruin. There is a relatively close match between Thranduil and Bard, with the Elven King of Mirkwood edging out the Bowman of Laketown. Bard’s son Bain is faring even worse in his match up with Azog. This calls for some voter help, Bain came to his father’s aid while the town was burning under the wrath of an angry dragon, the least we can do is vote for them and see how things play out. Over on the final division of non-ME characters: Benedict Cumberbatch’s Sherlock is so soundly beating Stephen Fry’s Oscar Wilde, it’s almost as if something very large has been dropped on him. This writer’s favorite match up in this round is Luke Evan’s Gaston from Beauty and the Beast against Hugo Weaving’s Agent Smith from the Matrix. A battle of the bragalicious Gaston up against the master manipulator within the Matrix is just something that should be onscreen. Right now, Agent Smith is defeating Gaston. A match that is all but over is that of Lee Pace’s Ronan from Guardians of the Galaxy wiping the floor with John Bell’s Young Iain from Outland, poor lad never stood a chance. And the very last match up to get coverage tonight see’s a near tie between Evangeline Lilly’s Kate Austen from Lost squaring off with Manu Bennet’s Deathstroke from Arrow, another match up I would love to see on screen. Last chance to vote in Round 1 is 10pm et on Thursday, March 22. Round 2 will begin on Friday, March 23. 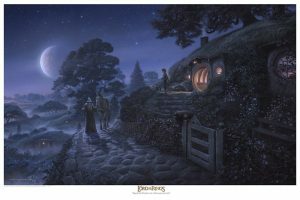 One of the best artist out there Jerry Vanderstelt is back with a beautiful new landscape print capturing Bag End in such a fantastic way. Not only that but you get Gandalf and Frodo about to have what may be a very important conversation in the quiet of Hobbiton. This superb print is available in both Giclee for $80 and canvas for $225, with other options available at checkout. The cherry on top of this print is that it is in stock, so there is no wait to getting it. 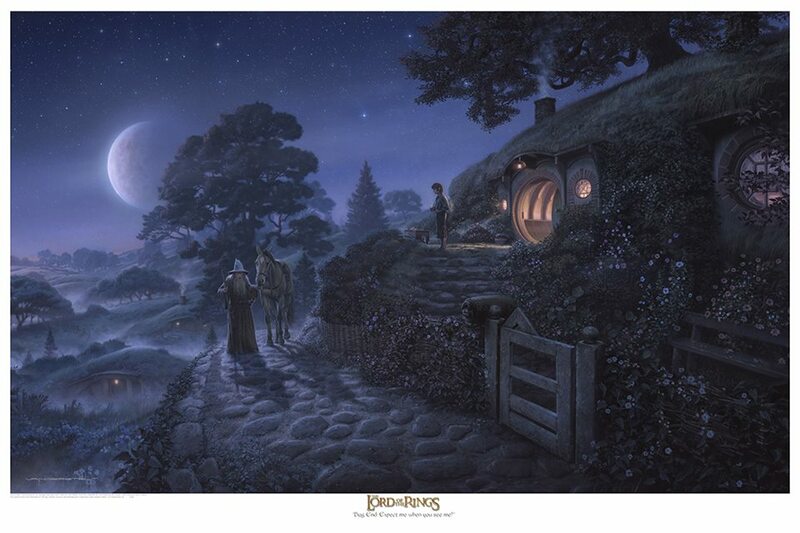 Make sure to grab this print, as Jerry’s work is among the best you will find when it comes to anything Middle-earth. As we approach that season of giving you may be looking for a great item for the Middle-earth fan in your life. Our friends at Weta Workshop have some amazing deals for you that should check any box on any fan’s list. We have deals ranging from 2 for $199 1:6 statues to those fantastic Mini-Epics for only $25. Those are just the tip of the ice berg when it comes to what you will find on Weta Workshop’s Black Friday Page. They also have deals for other properties they’ve worked on if you have a fan that likes something besides just Middle-earth items. Don’t wait too long though as these deals will end on November 27th at 11:59 pm PST. 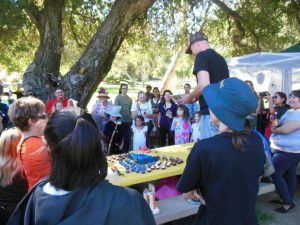 Come One, Come All, the Baggins Birthday Bash is coming in just 3 weeks, time to party like Hobbits, Dwarves, Elves and Men, and maybe the more well behaved Orcs. Costumes welcome, but not required. There will be a contest, with all pomp and circumstance. The Cake and Cupcake contest is back as well, Tolkien themed designs only, please. 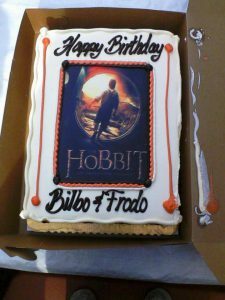 Quotes contest – The Hobbit is 80 years old on September 21, so let’s keep quotes to just The Hobbit, film or book in honor of the book that introduced Middle-earth to the World. There may be a few games as well, such as Golfimbul, depending on how much yummy food and fellowship there is, or the temperatures. Actually, the weather may also impact the number of costumes or the viability of the Cakes. I’m sure some of you remember the great Cake meltdown a few years back. Survival, on hot days, an umbrella or pop up tent work really well, so bring them, and chairs because the park benches don’t move. On not so hot days, still bring the pop ups or at least the chairs. Food, yes, this is a Potluck party, so bring food, at least 6 servings worth, but let’s not forget cups, plates, napkins and flatware. If you have an ice chest, bring it. Whether it is personal sized, for your own beverages, or super big to help keep lots of water, soda or juice cold. Bottles are preferred because yellowjackets do seem to like picnics too. Please check out the Facebook event page (linked above) to RSVP your attendance and what you plan to bring, or you can RSVP to me at Garfeimao@TheOneRing.net just so we have an idea of what is being brought and where we need to fill in the gaps. And yes, children are very welcome, bring the whole family. Almost four years ago I showed off my collection as it looked upon putting it in its own room. A lot has happened since then and I thought it was time to show how things look right now. As you will see I’ve added a lot of pieces, cabinet, and bookshelf since the last time I showed off my collection. This is for me, as I said, my way of showing off how much I love Middle-earth. 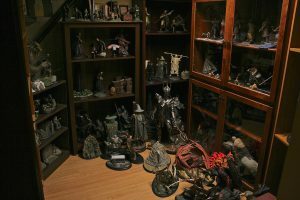 My collection encompasses pieces from Weta Workshop, Sideshow Collectibles, Badali Jewelry, Noble Collection, United Cutlery, and even custom pieces. So I hope you enjoy taking a tour of my collection. Comic-Con 2017 may be over but our coverage still has a little left for you all. 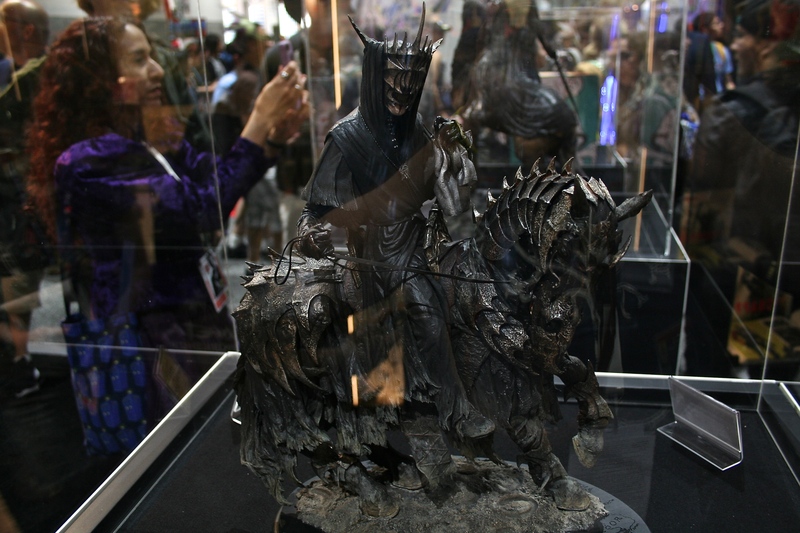 Our friends at Weta Workshop had some really awesome pieces this year and were full of surprises. 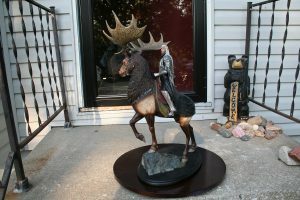 They hit us with pieces like Thranduil on Elk as well as the Gollum 1:3 mixed media statue. Both these pieces are fantastic and pieces nobody saw coming, which made covering the booth even more exciting. We had two pieces that fans had long been waiting to see, where fans could order them and get them added to their collections. Of course one of those was Grond who we had been patiently waiting to be able to order, and then we also got the Mouth of Sauron on Steed. 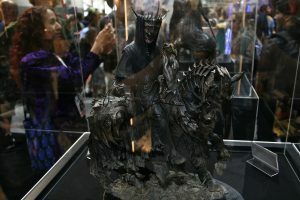 Both pieces are limited with Grond at 500 pieces and the Mouth of Sauron at 750 pieces. Fans can expect these won’t last long so make sure to get your pre-orders in now.